TK-2180/3180 defines a bold new standard for portable radio performance, scoring high marks for operating ease, versatility and reliability. 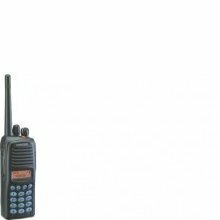 The TK-2180/3180 models feature wide band UHF (70 MHz) and VHF (38 MHz) coverage in one radio model. portables functionally practical, rugged and an attractive piece of equipment to carry. Kenwood utilizes its long standing audio heritage to optimize voice frequency components so that the audio output cuts through typical ambient noise. This enhancement and the companded noise reduction provide clarity and low distortion. The TK-2180/3180 offers convenient hands-free operation with a compatible headset. The TK-2180/3180 internal VOX (voice-operated transmission) circuitry provides automatic PTT and a 10-level sensitivity adjustment for different ambient noise levels. The TK-2180/3180 is built to survive the hard knocks, drops and harsh weather environments of its users. It meets or exceeds the stringent IP54/55 dust and water protection standards and the MIL-STD 810 C, D, E & F environmental standards including the demanding “blowing rain” test. Kenwood’s FleetSync® digital signalling system includes PTT ID digital ANI for instant radio call identification and Emergency status for personnel safety. FleetSync also includes status messaging, selective calling and short/long text dispatch messaging features. The TK-2180/3180 supports either original FleetSync® or FleetSync® II*. * FleetSync and FleetSync II are incompatible. Dual-Priority Scan automatically checks two important channels for activity while channel scanning. Also, each radio can be programmed to scan any organization of channels and talk groups using the many programmable scan features and parameters. In addition to FleetSync®, the TK-2180/3180 includes the industry standard signalling formats: QT/DQT, DTMF and 5-tone. In particular, 5-tone signalling has been significantly enhanced for greater flexibility, and current users of this format will welcome the fact that it can be used in combination with FleetSync® for Short/Long Text Messaging. ZVEI-Digital signalling and a voting function that utilizes the signalling can be added as optional software. This innovative Kenwood option makes several functions possible. ‘‘Voice Guide’’ announces channel, zone, feature activation/deactivation, etc. in a clear synthesised voice. ‘‘Voice Storage’’ records up to 300 seconds of receive audio for missed calls or your own voice for memo recording. It also has an ‘‘Auto-Reply’’ greeting and can record voice messages for unattended radios while away from the radio or while in a meeting (the calling unit must send a FleetSync® selective call for activation). * Announcement only available in English. Please note NoN EU Countries only. Kenwood’s plug-in option port enables installation of the external boards such as the VGS-1 Voice Guide and Storage Unit quick and simple. A new Kenwood feature, this realtime clock can be used for basic time-stamping. This ingenious feature provides an extra layer of security and safety for individuals who work remotely as well as for those who work in hazardous areas. As long as the buttons are pressed regularly, the radio operates normally; however, if there is a long lapse (programmable), it will sound an alert. In the absence of further response from the user, the TK-2180/3180 will place an emergency call to a pre-determined person or group of people.